This people search or people hunt activity was designed as an interpersonal communicative activity to get students talking on a Monday. 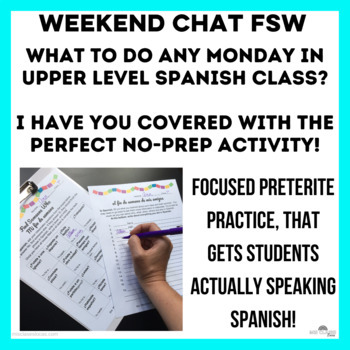 It would be great for students who have some Spanish background knowledge such as Spanish 2, Spanish 3 or Spanish 4 to talk about what they did over the weekend. It is a great icebreaker for a Monday after a break. It is a great way to review or introduce the past tense (preterite). Even if students have had limited exposure to past tense, all forms needed are provided on the easier version. There is an extension to have students write about what their class did as well. Two versions are provided. Version 1 provides more support and includes all I & s/he forms. Version 2 does not and would more appropriate for upper levels. This resource is in PDF form only. This resource is included in the Para Empezar: 1 Year of Weekend Chat for Spanish class. Please do not purchase this if you have that resource. Find Someone Who - Weekend Talk (past tense). Find Someone Who - Mi Verano (past tense). Find Someone Who - Holiday Break (past tense). Find Someone Who - Spring Break (past tense). Find Someone Who - Este verano - (future tense). Find Someone Who - high frequency words - Present Tense. Find Someone Who - high frequency words - Imperfect Tense. 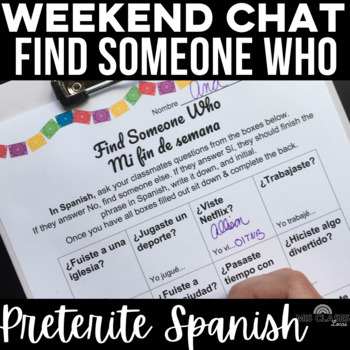 Find Someone Who - high frequency words - Preterite Tense. Find Someone Who - Sweet 16 - Present tense. Find Someone Who - Discuss any novel. For more information, check out my blog - Mis Clases Locas .